Good Morning, my friends! It’s time for another restaurant review and boy do I really love this one! I love eating out and ordering everything. Sometimes, you have to let go of the “healthy” mindset, and just indulge in the options presented. Try something new. Branch out. Order the fries. Order the dessert. Order the cocktail. Live it up and enjoy the experience. A few weeks ago, Ed and I dined at The Dogwood near Southpark. When we were talking about how we would describe the food and the atmosphere at the Dogwood, we agreed that it was trendy, hyped up Southern food. I can’t stop speaking their praises after a delicious meal. The mangers, Tim and Scott, were so pleasant and welcoming, and really provided great information about the mission and culture of The Dogwood. It’s fun to learn a little bit about the backstory of the restaurant and management, and see how they really transform their personality into the culture of the restaurant and the food. Plus, they both love running, so that makes them super cool in my book. The Dogwood is a subsidiary of Dresslers’ restaurant, an upscale restaurant that specializes in steaks and seafood. While they describe themselves as a “modern Southern kitchen,” they have culminated a local, rustic atmosphere, similar to a modern barn. They have beautiful brick columns and a wooden beams, and an inviting environment. I just want to invite all my friends and have a cozy dinner together. There are pictures on the wall taken by Tim, the General Manager, from farms throughout the state, and add a neat touch to the local culture within. By checking out their website, you will find the variety of local farms in the Carolinas they source food from. And they stick to their belief of local products – even the flowers on the table and the soap in the bathroom are both sourced in Charlotte (You can buy the soap at Ruby’s in NODA). The Dogwood offers 80 different bourbons, making them the largest collector of bourbon in Charlotte. As expected, the menu offers a variety of bourbon flights. Speaking of spirits, they also offer a variety of craft cocktails, and on Wednesdays, they do a cocktail night where you can taste the bartender’s new concoction of the week for $5.00! Killer deal if you’re a craft cocktail lover like me. Let’s be friends. My favorite was the Salty Dog, with vodka, grapefruit bitters, and Himalayan pink sea salt. 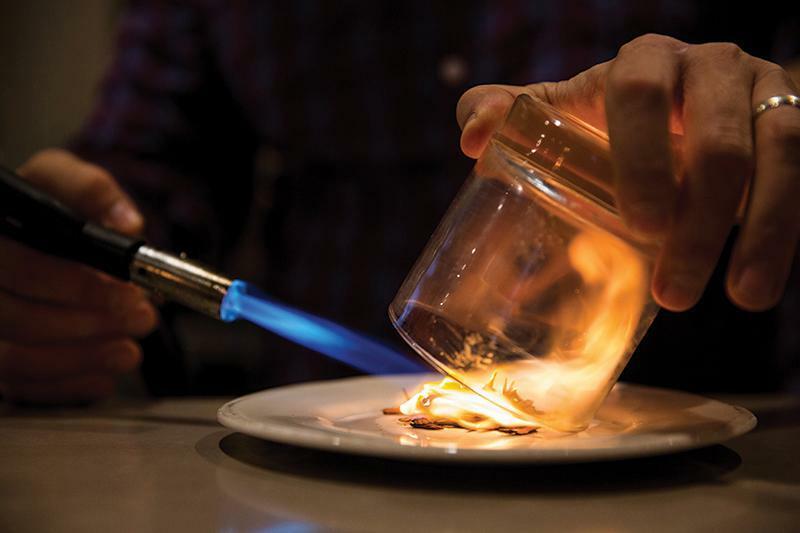 If you’re a fan of rye whiskey, don’t miss out on the Legends of the Fall, served in a cinnamon bark smoked glass with burnt simple syrup, orange liqueur, and house cherry bitters. They actually smoke the bark in front of you! To start, you should order the bacon jam, a simple yet complex dish. The bacon jam is made with only 5 ingredients, including coffee grinds, and gives you that hint of sweet and savory simultaneously. It’s served with country bread to soak up it’s goodness. Word on the street is that it’s a favorite pregame meal for Panthers coach, Ron Rivera. It may not be pretty but is sure is tasty. We tried the Duck Ham next, which is served over a blend of watercress and sorrel, garnished with radishes, pistachios and a raspberry gastrique. I couldn’t have the pistachios but I enjoyed the taste of the duck. If you’re into tartars, the bison tartar was fabulous. The house mustard gave it an entirely different complexity, and helped balance some of the natural saltiness. It’s served with a quail egg on top that provides a more savory flavor, and of course, some delicious toast to soak it up. If you’re seeking happy hour specials, the Dogwood offers $1.00 oysters Monday through Friday in the bar area. They have the option of North Carolina oysters, Virginia Coast oysters, or their own roasted oysters. We tried 2 of the NC oysters and 2 of the Virginia Coast oysters (usually a little larger, though it depends on that week’s catch). As a Rhode Island girl, I love my oysters. And they’re full of iron, B12, selenium, copper and many other nutrition stars. I can never pass up scallops, so we went with the scallop dish for our main meal. The combination of flavors just on the dish itself would have been good on their own without the scallops! Served over butternut, kale, and fingerling potatoes with an oxtail marmalade, this dish was heaven. The scallops were so tender and flavorful that they melt in your mouth. This dish was a true winner and I loved every bite. For sides, I recommend the seasonal and local lemon-seared SC asparagus with country ham bacon bites that give a delectable crunch, and the roasted beets, served in an orange-mint vinaigrette. Citrus and beets go together like peanut butter and jelly, you have a little tang from the citrus and the natural sweetness from the beets. For dessert, please, and I repeat, please do not miss out on Mom’s Cheesecake, which is a secret recipe from Mrs. Dressler, made in her own kitchen! It is the best cheesecake you’ll ever have the pleasure of biting into. You know how you can order cheesecakes and sometimes they’re a little bit frozen in the middle, or they are too lumpy? Not this one. The consistency is impeccable and your fork goes straight through. It’s smooth, creamy and rich, with a perfect graham crust. They also do seasonal sorbets and gelato, made in house. We tried the tahini gelato, which was definitely different and not something I’d typically order. It wasn’t overly tahini flavored, which surprised me, as I was expecting something deeper and bolder. It was good, but I much preferred the strawberry rhubarb sorbet, which was refreshing, fruity, and the perfect combination of tart and sweet. The perfect end to a night full of delicious dishes and a full belly and soul.